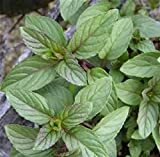 Chocolate Mint plant growing herbaceous of the genus Mentha also known as Chocolate Mentha piperita, Chocolate Mint plant perennial evergreen plant also used as fragrant plant, can grow in mediterranean, subtropical climate and growing in hardiness zone 9b-11. Leaves color green oval with strong odor of Chocolate (with imagination). Green oval with strong odor of Chocolate (with imagination).